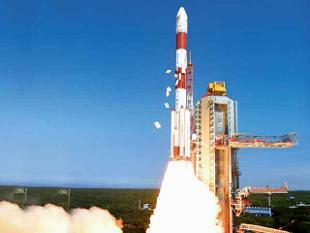 In its thirty sixth flight (PSLV-C34), ISRO’s Polar Satellite Launch Vehicle successfully launched the 727.5 kg Cartosat-2 Series Satellite along with 19 co-passenger satellites today morning (June 22, 2016) from Satish Dhawan Space Centre SHAR, Sriharikota. This is the thirty fifth consecutively successful mission of PSLV and the fourteenth in its ‘XL’ configuration. The total weight of all the 20 satellites carried on-board PSLV-C34 was 1288 kg. After PSLV-C34 lift-off at 0926 hrs (9:26 am) IST from the Second Launch Pad with the ignition of the first stage, the subsequent important flight events, namely, strap-on ignitions and separations, first stage separation, second stage ignition, heat-shield separation, second stage separation, third stage ignition and separation, fourth stage ignition and cut-off, took place as planned. After a flight of 16 minutes 30 seconds, the satellites achieved a polar Sun Synchronous Orbit of 508 km inclined at an angle of 97.5 degree to the equator (very close to the intended orbit) and in the succeeding 10 minutes, all the 20 satellites successfully separated from the PSLV fourth stage in a predetermined sequence. After separation, the two solar arrays of Cartosat-2 series satellite were deployed automatically and ISRO’s Telemetry, Tracking and Command Network (ISTRAC) at Bangalore took over the control of the satellite. In the coming days, the satellite will be brought to its final operational configuration following which it will begin to provide remote sensing services using its panchromatic (black and white) and multispectral (colour) cameras. The imagery sent by the Cartosat-2 series satellite will be useful for cartographic applications, urban and rural applications, coastal land use and regulation, utility management like road network monitoring, water distribution, creation of land use maps, precision study, change detection to bring out geographical and manmade features and various other Land Information System (LIS) and Geographical Information System (GIS) applications. Of the 19 co-passenger satellites carried by PSLV-C34, two – SATHYABAMASAT weighing 1.5 kg and SWAYAM weighing 1 kg – are University/Academic institute satellites and were built with the involvement of students from Sathyabama University, Chennai and College Of Engineering, Pune, respectively. The remaining 17 co-passenger satellites were international customer satellites from Canada (2), Germany (1), Indonesia (1) and the United States (13). With today’s successful launch, the total number of satellites launched by India’s workhorse launch vehicle PSLV has reached 113, of which 39 are Indian and the remaining 74 from abroad. This entry was posted in Nation, Sciences and tagged Indian Space Program, ISRO, PSLV on June 23, 2016 by arisebharat. Bharat ki Jai! The motherland has shown her superioriety in intellectual thinking to the rest of the world.The race who gave the world a practical system of maths released the potential of the hidden universe to all is now claiming her place as leader amongst nations! now the Chinese threat has to be negated with the deployment of Agni-5 & Brahmos missles to Asian nations who are in conflict with China- this should make them rethink their position in supporting the devil state of Asur-Pakistan!